Source: BEA 2012- Thanks, Harper! Divergent left off with the notion of a rapid war that will eventually affect all factions. There is no time to waste. Tris and her gang find solace for a while in the Amity headquarters, but peace can’t last with war on their doorstep. Choices and sides need to be decided. It comes down to believing in the truth or doing what’s right. Tris has to make a choice or she will lose everyone she loves. Insurgent is a fast-paced, emotional roller coaster filled with adventures you don’t want to forget and keep thinking about long after you put it back on your bookshelf. Sequels usually start with a little catch-up but Veronica Roth dived into Insurgent like it was real life. There was no slowing down, no back story and I liked it better that way. That made the plot even more interesting, when there was loads of action in the beginning. 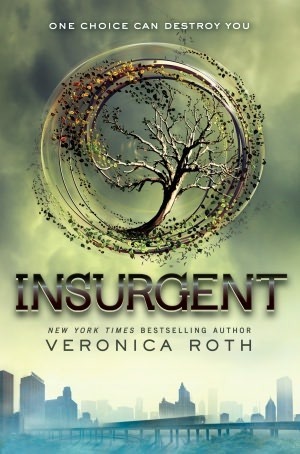 However, for those of you who’ve read Divergent a while ago, I do suggest that you might want to read the last few chapters before falling into Insurgent. The covers of these books have, officially, grown on me. I love the way they tie into the story, with the different factions. The covers help bring life to this world that Roth has so cleverly drawn. Roth’s writing style hasn’t changed from the first. First person present tense is a bit new for me, because I don’t read many books with that tense. It’s a Dauntless move, I suppose, making the tense that way but it works. 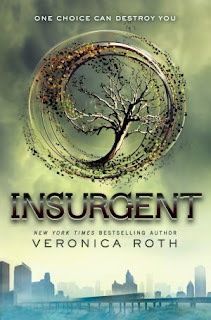 I know in my Divergent review, I didn’t quite like the tense and how it was written but after reading Insurgent, the tense and Roth’s fantastic diction immersed me into the story even deeper than I was before. The plot was incredible. Roth has a way with letting the story flow with piling up the action. I felt like I didn’t get to breathe, there were so many awesome scenes going on that I could not take a break; I needed to complete Insurgent. As I did with Divergent, I yelled at myself numerous times for not reading it fast enough. You know, when I watch movies and read books I really love, I get chills and goose bumps. Well Insurgent is no stranger to my chills because I really really loved this book. There were not so many new characters as there was character growth. I want to get inside Four’s head and try to figure him out. Tris can’t even figure him out sometimes and I would really love to know what he is thinking. Tris disappointed me and I didn’t like the direction she was heading toward in the middle of the novel. 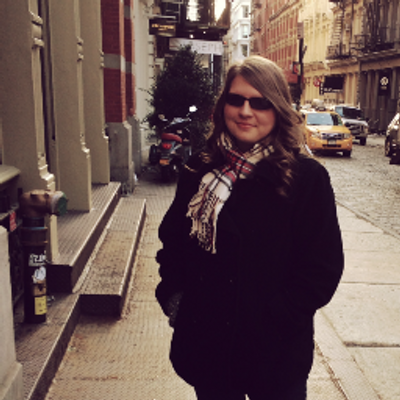 I understood her reasoning behind her decisions but I still could not support what she was about to do. Spoiler: Tris was suicidal and as a reader, I dislike reading books where the main characters want to die. I tolerated this because I loved the plot but this component of her character bothered me. However, she is not suicidal the entire book, which helped me decide what to rate this review. The ending! Oh, it was so amazing! There was a scene in the book where Marcus describes the emotions that you will feel after getting this information. Roth made sure to leave it on such a note that the reader would get a taste of exactly what Marcus described which was such a smart move that even though I finished the book, I still feel a part of it. Divergent was something new, exciting, and breathtaking. Veronica Roth took her second novel, Insurgent, to a whole new level. I connected with the characters so well that by the end my right shoulder hurt (from where Tris got shot). The plot is a crazy whirlwind of greatness that leaves you wondering why the third book in the series is not out yet. Rated PG-13 for nonstop action, steamy scenes, heartbreaking emotions, blood and gore, and violence. I made the mistake of reading Insurgent about seven months after finishing Divergent so being thrown right back in was a little hard for me. I had that same disorienting feeling that happens when you jump into freezing cold water, expecting it to be cold, but not that cold! After awhile though I adjusted and really enjoyed the story. I think what I loved most was getting to know some other factions better and getting a glimpse into the way they see things. Sometimes it was incredibly frustrating, but overall super interesting.